Shark Attacks Down. Humans in Ocean Up. – Neptune 911! Home › Sharks › Shark Attacks Down. Humans in Ocean Up. Shark Attacks Down. Humans in Ocean Up. We are in the midst of a shark frenzy. In recent weeks, there has been a spate of reported attacks on both coasts of the United States. The frenzy, however, appears to be more a product of our fears than an actual uptick in the risk of shark encounters, according to a new Stanford-led study. 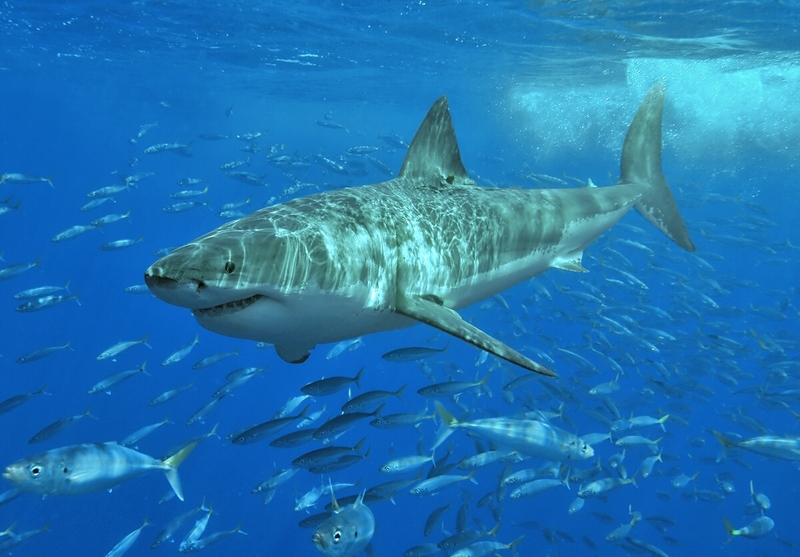 The study, to be published later this month in Frontiers in Ecology and the Environment, finds that despite increasing records of shark attacks – mostly by white sharks – in California, the individual attack risk has dropped by more than 91 percent during the past six decades. Rather than cull sharks – which research shows has no effect on the risks of an encounter – resource managers should promote safe ocean-going behavior by providing information on how risk varies among locations and times, according to the study. The researchers show that increasing reports of shark attacks are due to an increased human population and more ocean recreation. The decline in actual risk may be due to factors such as a drop in the white shark population off California’s coast and a shift in white shark spatial distribution in response to growing populations of seals – a favorite prey. Sharks play a vital role in marine ecosystems, and can benefit humans. For example, research has linked a drop in shark numbers to the collapse of a North Carolina bay scallops fishery due to an outbreak of scallop-eating rays normally controlled by sharks. Likewise, research has shown that the loss of large predators like lions and leopards in sub-Saharan Africa has led to higher rates of intestinal parasite infections among baboons and humans who live in close proximity. The study’s results indicate that healthier ecosystems are safer when it comes to human-shark interaction. In California, for example, effective marine management leading to the recovery of elephant seals has concentrated sharks around seal colonies and away from human beachgoers. Scuba divers are 6,897 times more likely to be hospitalized for diving-related decompression sickness than for white shark bites. Ocean-goers are 1,817 times more likely to drown than die from a shark attack. Scuba divers have a 1-in-136 million chance of being bitten. Surfers have a 1-in-17 million chance of being bitten.The best way to avoid a shark encounter is to avoid locations and seasons where risk is highest, the study’s authors advise. For example, the riskiest time and place for California surfers is October and November in Mendocino County. That risk can be reduced 25-fold if you surf in March, and more than 1,600-fold if you surf in March between San Diego and Los Angeles. Co-authors of the research paper, “Reconciling Predator Conservation with Public Safety,” include Salvador Jorgensen of the Monterey Bay Aquarium; Taylor K. Chapple of Hopkins Marine Station; and Giulio De Leo, a Stanford professor of biology and senior fellow at the Stanford Woods Institute. The research was funded by the Lenfest Ocean Program. Why Are Cetaceans Stranding on Cornwall Beaches? Why Are Pacific Coast Sea Stars Melting?